In September 2004 we were fortunate to acquire a significant collection of hand-carved wooden milagre (miracle) ex-votos from the states of Ceará and Pernambuco, in northeastern Brazil. These milagres were collected by Dr. Adalberto Barreto, a Brazilian doctor who used them to study the nature and prevalence of various physical ailments among the people of a remote rural region of Brazil. 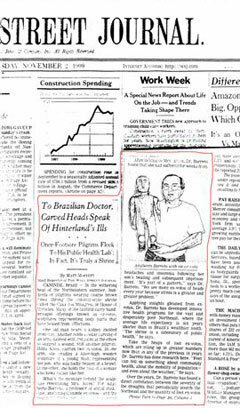 Dr. Barreto and his work were described in a Nov. 2, 1999 article in the Wall Street Journal with the lengthy title "To Brazilian Doctor, Carved Heads Speak of Hinterland's Ills ---Once-Footsore Pilgrims Flock to His Public Health 'Lab': In Fact It's Truly a Shrine". In northeastern Brazil, ex-votos, called milagres in Portuguese, can be found at hundreds of important shrines where pilgrims bring them in fulfillment of vows. The... milagres shown here are all made of wood and and are from the popular shrine of Sao Francisco das Chagas in northeastern Brazil. Each shows the particular affliction that prompted the pilgrimage - a wounded hand, recovery from breast surgery, a twisted ankle. Although this community is visited by pilgrims throughout the year, during the October week in which the patron saint is celebrated, hundreds of thousands of pilgrims make the long trek to Canindé, many dressed in the rough brown garb of pilgrims. Tens of thousands of ex-votos are offered, most similar to those shown here, others taking the form of before/after photos of burn victims, children injured in automobile accidents, and people shot during domestic squabbles. Politicians offer campaign posters as testaments to Sao Francisco's help in the race for local offices. Sao Francisco das Chagas, like most other important shrines in Brazil, has a Casa dos Milagres, House of Miracles, where milagres are displayed. Those which are very special in some way are gleaned for the church's small museum on the other side of town. 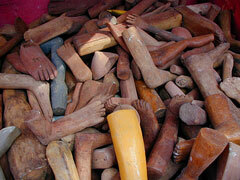 Most are eventually destroyed to make room for new offerings. 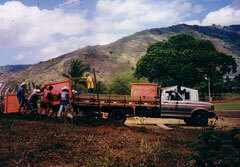 Milagre collection leaving Ceará, Brazil in 2003. A look inside one of the boxes. 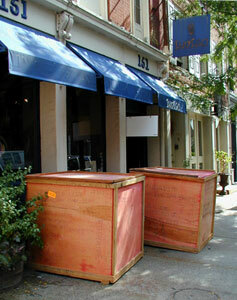 Milagres arrive at Indigo Arts Gallery in Philadelphia, September 2004.